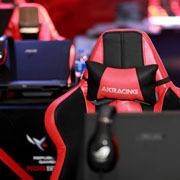 AKRACING is a mainly export-oriented racing chair manufacturer, based on independent research and comprehensive international racing chair trend and technology, professional production of various kinds of high-end racing seats, and can provide (design) for each applicable class car seat mounting bracket. AKRACING's main business are car seats and parts. AKRACING's strong technical force and strong independent development capacity can produce all kinds racing seat class base on customer requirements, ATV seats, modified car seats and office chairs. AKRACING advocacy style has been leading car seat design trends;attract attention to the new, the introduction of environmentally friendly materials. Developed a set of strict management system, strict control of all aspects of the business process. For a long time, we have been standing on customer's empathy, so that customers get more enjoyment. Through continuous development, AK-RACING has a number of creative designers and skilled professional production team. We design a young, imaginative, with the ability to engage in a variety of racing seats designed so that we in the national racing seats sector occupies a certain position, enjoys a certain reputation and good name. Our production team through professional technical training and quality education. For the production team to strengthen labor discipline, uniform dress, with a certificate for employment, civilized operation, strictly regulate the on-site production process management. Over the years, the company based on modern technology combine theory and production practices, has been determined to forge ahead in the racing seat manufacturing market, the implementation of "good faith, service weight, quality first, users first" business philosophy, the "pragmatic, innovative, pioneering and enterprising" spirit of enterprise. With the prosperity and development of the national market, the company also continues to develop and grow, make your own design and manufacturing work more professional skills, quality to the next level, so as to better serve our customers; continue to develop a large number of novelty, improve the quality of the product; painstaking customer service; in the course of the operation, fully embodies the "integrity", "strength", "innovation" witness consumers establish a good corporate image and reputation.